I enjoy sawing, chiseling, and planing wood more than finishing it. However, with few exceptions, the Yogiism of woodworking holds true: the project ain’t done till it’s finished. An earlier post discussed the importance of considering finish options and testing them in the design stage of a woodwork project. Here I will present an overview of the finishes I use most. This is by no means to suggest that these are the best finishes or what you should use, but is simply a list of one person’s preferences which might be useful to others. Plastic, oil, and wax are less attractive than wood so I view their role as enhancing what the wood has to offer. I like relatively low key finishes that enliven the wood’s assets without being obtrusive. In this way, one is struck by the beauty of the wood and not the finish itself. 1. 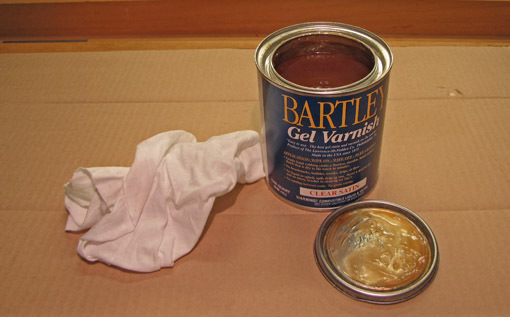 Bartley’s Gel Varnish, Satin. Very easy to apply, good solids content, warm sheen, over 15 year track record of durability on my projects. The player most likely to take the shot in crunch time. 2. General Finishes High Performance Polyurethane Water Based Top Coat, Satin. I use this when I want to minimize the color change to the wood. I usually pad it on quickly, use two coats, and add a final rub out with Mirlon 2500 pads or Fibral fine “wool.” A role player, but the best in the league at this position. 3. Shellac. Blonde flakes (Behlen’s/Rockler) or Zinsser Sealcoat. I usually pad on a one-pound cut, maybe thinner, and build it until it looks right which for me means not too much. Wax over it. This is the finesse player with a style like no other. 4. Oil-varnish blends. Watco Danish Oil is a bit lighter in color than Minwax Antique Oil Finish. This is a workhorse player. However, it should be used thoughtfully for an intentionally modest finish and not by default just to get the job done. Beware of blotching some woods. 5. Renaissance wax. Quality player but only rarely can create his own shot. For using over some finishes, especially shellac. Use a darker wax on woods such as walnut. 6. Minwax Wipe-on Poly. Comes from Home Depot U. so doesn’t get a lot of respect but can sometimes get it done without taking up much cap space. 7. Nothing. Sometimes that’s all you need and a tie gets you to the playoffs. Stains or dyes rarely make the cut. Occasionally a black pigment stain is useful to ebonize small accents such as beading strips, and some oaks seem to respond well to some dyes and stains. Sometimes a brush-on varnish is useful for a table top that needs extra protection. Coming soon will be some photos to demonstrate the value of choosing finishes early on in planning a project. Game on. There is an interesting way to do color accents – artist oil paints. Some of the colors available are so archival they will probably outlast the wood. I find them interesting on end grain. I use them with linseed. I’ve never tried mixing them with any other finish but anything petroleum based should work. First, I love your blog. I couldn’t agree more with your perspective on finishing – I love wood in it’s most natural state as well and tend toward those finishes that leave it as close to that state as possible. I’ve never used Bartleys and thought I’d give it a try on my next project. In doing a bit of online research it appears as though the company that produces the product has gone out of business. From what I can tell, Lawrence McFadden Co. is the one who makes Bartleys Gel Varnish and closed it’s doors in early January. Please let me know if I’m wrong, I’d really like to try the product. Also, please keep up your wonderful blog. I know at times blogging can feel tedious but know that at least one person out here really enjoys your work and anxiously looks forward to each new post. Thanks for the kind words and for the heads up on Bartley’s. I bought my last can this past Fall and did not know that Lawrence McFadden Co., the manufacturer, was going out of business. I will write information in a separate post tonight because I do not want readers to be mislead by the current post. Thanks so much again, Christian, for the timely alert!